Perched along the North Norfolk coast, the seaside village of Cromer is best known for its fresh crabs, beautiful beaches and rich fishing heritage. Stroll along Cromer’s quaint streets and shop for souvenirs, market goods, high-end fashions or arts and crafts. Discover variety shows and live entertainment at the theater on the pier, or dine at the local restaurants and cozy cafés.A coastal resort with a charming appeal, Cromer Country Club offers practical and modern conveniences for an elevated standard of comfort. Well-appointed furnishings and spacious accommodations afford the ultimate in relaxation. The extensive on-site activities and resort-style amenities provide the ideal family escape. From badminton, aquarobics and a game room, to the fitness center, sauna and steam room, entertainment abounds at this English retreat.Return from a day of exploring Cromer and relax poolside or unwind in the whirlpool. The busy bar serves a range of quick snacks and healthy bar meals, while the elegant restaurant presents chef-inspired dinners on its menu. This lively family destination offers accommodations featuring modern conveniences and comfortable furnishings. Studio accommodations offer a double bed, spacious living area and full bathroom complete with a shower, heated towel rail and shaver point. The studio accommodation is an open plan lay out with separate bathroom facility. Enjoy the conveniences of the full kitchen equipped with microwave, oven, toaster and refrigerator. Additional in-room amenities include television and DVD player. Studio accommodations can be found on either the ground or first floor. This lively family destination offers accommodations featuring modern conveniences and comfortable furnishings. Each accommodation offers a double bed, spacious living area and full bathroom complete with a shower, heated towel rail and shaver point. Our 1 bedroom accommodations can be found on the ground floor. They include a living area, kitchen, double bedroom and bathroom. The accommodation offers a sofa bed in the living area for the additional guests. Please be advised the maximum occupancy of this accommodation is 4 people. Enjoy the conveniences of the full kitchen equipped with microwave, oven, toaster and refrigerator. Additional in-room amenities include television and DVD player. This lively family destination offers accommodations featuring modern conveniences and comfortable furnishings. Each accommodation offers a double bed, spacious living area and full bathroom complete with a shower, heated towel rail and shaver point. Our 1 bedroom superior accommodations are based over two floors with living area and kitchen based on the ground floor. The double bedroom and bathroom are located upstairs within the accommodation and a sofa bed is also available in the living area for the additional guests. Please be advised the maximum occupancy of this accommodation is 4 people. Enjoy the conveniences of the full kitchen equipped with microwave, oven, toaster and refrigerator. Additional in-room amenities include television and DVD player. All 1 bedroom superior accommodations offer a balcony area from the bedroom upstairs. This lively family destination offers accommodations featuring modern conveniences and comfortable furnishings. Each accommodation offers a double bedroom, twin bedroom, spacious living area and full bathroom complete with a shower, heated towel rail and shaver point. Our 2 bedroom accommodations lay out over two floors. With the kitchen, living area and first bathroom located on the ground floor and the double bedroom, twin bedroom and second bathroom located upstairs. There is a sofa bed in the living area for the additional guests. Please be advised the maximum occupancy of this accommodation is 6 people. Enjoy the conveniences of the full kitchen equipped with microwave, oven, toaster and refrigerator. Additional in-room amenities include television and DVD player. 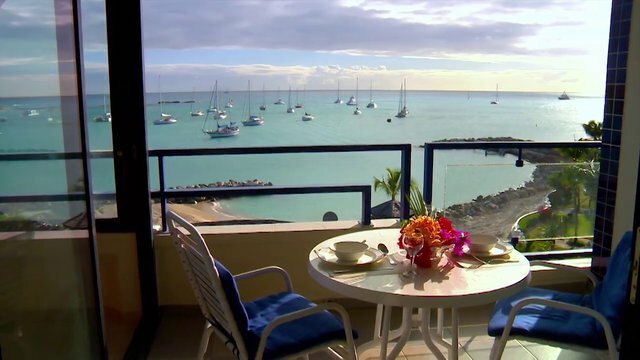 All of our 2 bedroom accommodations have a balcony leading from the living area. This lively family destination offers accommodations featuring modern conveniences and comfortable furnishings. Each accommodation offers a double bedroom, twin bedroom and single bedroom, spacious living area and full bathroom complete with a shower, heated towel rail and shaver point. Our 3 Bedroom accommodation has a lay out over two floors. With the living area, kitchen and first bathroom located on the ground floor and the double bedroom, twin bedroom,single bedroom and second bathroom upstairs of the accommodation. There is a sofa bed in the living area for the additional guests. Please note the maximum occupancy of this accommodation is 7 people. Enjoy the conveniences of the full kitchen equipped with microwave, oven, toaster and refrigerator. Additional in-room amenities include television and DVD player. All of our 3 bedroom accommodation offer a balcony from the living area. Driving: From Kings Lynn follow the signs for Cromer A148. On entering Cromer at the mini roundabout continue towards the town centre turning first left and then taking the right hand lane through town. At the second set of traffic lights after the Church turn left onto Overstrand Road. At the next mini roundabout continue bearing left. Cromer Country Club can be found at the top of the hill on the left hand side. Alternate Directions: At Liverpool Street Train Station look for the National Express Service to Norwich (trains usually run every half hour). On arrival at Norwich look for a connecting train service to Sheringham stopping at Cromer. At Cromer station you will require a taxi to reach the resort - approximately a 8-minute drive away. (Booking is necessary). Directions to Resort: (From London Stansted) Take the M11 north signposted Cambridge/East Anglia. Exit at junction 9 on the M11 and take the A11 signposted Newmarket/Norwich. Follow the A11 all the way to Norwich. When entering Norwich follow signs to Cromer A140. After passing through Roughton you will approach a T-junction; turn left onto the A149 to Cromer. Just before entering Cromer you will pass some new properties on the left and 100 yards later the road swings to the left. At this point take a right hand turn onto Station Road. At the end of this road take a left turn and Cromer Country Club can be found on the first right. Directions to Resort: (From London Gatwick airport) Head north on the M23, heading towards London M25. On the M25 head towards the Dartford Crossing and follow the M25 around until you come to junction 27 (M11). Take the M11 and follow signs to Cambridge/East Anglia. At junction 9 on the M11 take a left onto the A11 signposted Newmarket/Norwich and follow the road to Norwich. When entering Norwich follow signs to Cromer A140. After passing through Roughton you will approach a T-junction; turn left on to the A149 to Cromer. Just before entering Cromer you will pass some new properties on the left, 100 yards after which the road swings to the left. At this point take a right hand turn onto Station Road. At the end of this road take a left turn and Cromer Country Club can be found on the first right. Distance from Resort: Beach: 0.5 miles; Marina: 33 miles; Shops: 0.5 miles; Supermarket: 1 mile. Kennel: Warren Boarding Kennels, Beeston Regis, Sheringham, NR26 8TP Tel: 01263 822640; 8km from resort. Shops hours Supermarkets 8:30-20:00 Monday to Saturday, Sundays 10:00-16:00. Local shops in town 9:00-17:00. Please be aware that parking is limited to 1 space per room. No heavy goods vehicles or commercial vehicles including vans are allowed in the car park at any time. Please be advised that we do not have Z beds facilities on site at this resort. Please be advised that swim caps are recommended for hygiene reasons when using our indoor pool. Thank you for your co operation. Due to essential emergency maintenance work the Sun Terrace will be closed until further notice. We apologise for any inconvenience caused during this time. Please be advised that a credit card deposit of £100 is required at check in for all guests who are not members of Diamond Resorts International. Enhance your trip with Diamond Experiences Plus - fun activities to help all guests turn a stay with us into an unforgettable vacation. Check our events calendar to discover the experiences available to you at Cromer Country Club. Contact the resort for more details and to book before you arrive! If you have made a special request relevant to your accommodation we would respectfully ask you to note that we cannot guarantee it can be fulfilled. Join us for our second annual Recycling Campaign from 15 to 21 April. We will have fun activities planned for the whole family including workshops and games. Reduce your eco footprint and get smart about recycling while at home and on holiday. The take away service is available from 18:00 - 20:30 daily. As soon as your order is ready we will call you in your villa. Hospitality Pack: Within your accommodations you will find a Diamond Resorts International ® arrival hospitality pack consisting of tea bags, filter coffee and decaf sachet, sugar, sweetener, milk, salt, and pepper. For Hotel Guests only, the resort requires a valid credit card to charge a refundable security deposit of £100 per apartment upon check in. For Members of THE Club® the deposit is £0.01. Your deposit will be refunded at the end of your stay upon inspection of your apartment(s) however please note the funds will only appear in your account once processed by your financial institution. Special requests for specific apartment locations and views cannot be guaranteed. The hotel/resort will do try to accommodate your requests; however, they are based upon availability at the time of your apartment assignment at check-in. Pets not allowed (except assistance dogs). No commercial vehicles allowed in the car park. Free Wi-Fi is available at the property. Pet rules, charges and/or documentation: No pets are allowed on the resort (except assistance dogs). Highlights: Located in an area of natural beauty occupying a panoramic clifftop location, overlooking the seaside resort of Cromer one mile away. The resort is positioned on a hill with many steep steps and various gradients and inclines around the resort. Some areas of the resort may not be accessible. Pathways are uneven and access is difficult with some steps to access garden areas. Steps around the communal areas have non-slip treads and are marked with warning strips. Handrails on some steps. Accessed via external steps (11 steps in total). Alternative route into Reception can be accessed from rear of main building with sloped access. Three entrances (1) via slope by the back of the main building with 16 stairs (2) main entrance with 5 steps (3) accessible access via pool. Accessed via stairs and situated on level three. Sports Hall can be accessed via a bridge entrance for wheelchair users by arrangement. We have an accessible toilet facility which is available only in the women’s toilets. Can be accessed via Bar and Restaurant via stairs or accessed via a sloped patio area at rear of the main Reception building. This area has now been moved, games rooms is accessed on the first floor going up the internal stairs from Reception or by going through the sports hall to our lounge area. Accessed via Reception, then a further 8 steps down to the pool from the changing room facilities. Wheelchair access is available directly onto poolside from an outside lower level but no changing facility is available on poolside. Accessible changing room facility accessible via Reception. Shower facility on poolside. A pool hoist is available on the poolside. Two accessible parking bays directly outside Reception and one accessible parking bay opposite the accessible apartment and one on the top car park. Partially Wheelchair Accessible AccommodationSuitable for travellers with restricted walking ability who may need a wheelchair. Some areas within the accommodation and exterior are accessible. They have electric beds, adapted bathroom and special high backed chairs (kitchen units/work surfaces are standard height). We offer 1 accommodation in total: 1 studio accommodation. Accommodations have a variety of approaches and entrances including steps, ramps and uneven surfaces. Some accommodations are duplex with an internal staircase. Steps around the communal areas have non-slip treads and are marked with warning strips. Handrails on some steps. Dependent on operator and excursion offered, as these can and do change. A list is maintained by the resort Reception. Most supermarkets in the local area are accessible.